Sorry I haven't written on my blog for quite some time now, I have been very busy. Today, Utah's ABC4 News came out to start doing a story on my Joseph Smith Jr. photo. They will be airing it sometime in May during sweeps week, and the always gracious and beautiful Barb Smith is working on the story. It was great meeting her today and getting to tell her my story. What's next? I need to get up to SLC sometime in the near future to work on having the photo further authenticated. On a side note: The image above is a digitally enhanced and cropped version of the photo. I know people have been dying to see a better view of it. I think it really shows some of the character of his face. This is so exciting! Can't wait to see your and the picture's TV debut! Congratulations! This is just Awesome....I just read Rough Stone Rolling and I love the Joseph Smith Papers Project TV series....It is simply COOL! Don't you just love Genealogy... there is always something exciting hidden away to discover. 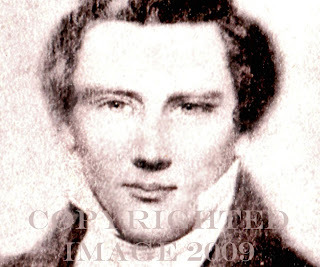 I LOVE this photo of Joseph Smith! This photograph really captures his youth; and to think those very eyes were a witness for ALL the world!